Yesterday I went kayaking down the Crowsnest River with a bunch of friends. It was a stretch of the river that none of us had gone down before, and frankly it was a bit boring with very little white water. At the halfway point we came upon Lundbreck Falls. The plan was to portage around it, but after taking some time to study it, I decided to go for it! The adrenaline rush totally made my day. 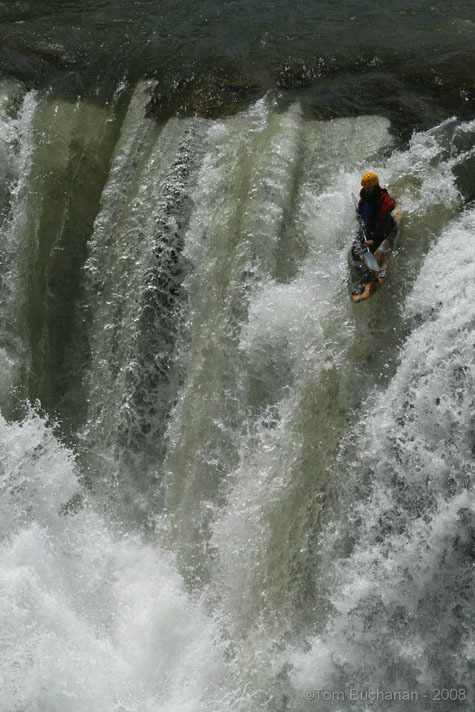 Jeff Milner going over Lundbreck Falls. Photo by Tom Buchanan (used on the web with permission). Here’s my Lundbreck Falls Run set on Flickr. Update: You can see me going over in this Lundbreck Falls Drop video on Youtube, compliments of my friend Janson.